Cookies are the best dessert! No, I'm not going to argue with you. One thing about being a Vegan, is that there is no shortage of cookies to choose from. My new cookie love is for the Late July Vanilla Bean Green Tea Sandwich Cookies. 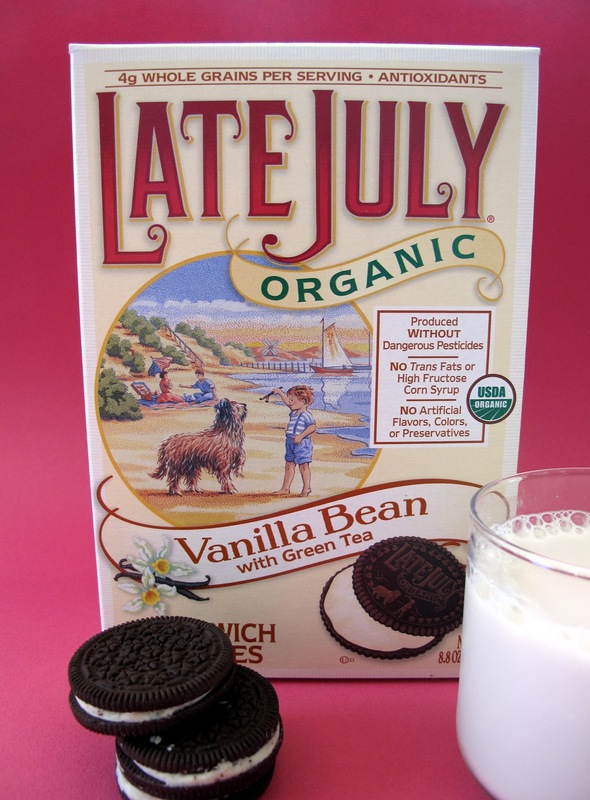 I used to be a big green tea drinker back in the day, so I was intrigued with how the flavor would represent in a cookie. If you are expecting a crazy herbal cookie, you are out of luck. The green tea is just a minor note in a delicious sweet sandwich cookie, and I enjoyed it! The mixture of the vanilla bean, the chocolate cookie and the green tea extract is the perfect symphony of flavors. As you can see in the pic, I got a little almond milk to dunk the cookies in and they were sooo good soft. If you love the typical chocolate and vanilla sandwich cookies, give these green tea laced cookies a try. It's a flavor that you might not even know you like, but end up loving! Can you get them back home? Mmmmm green tea & chocolate. I also must recommend Mint Oreos, assuming you don't mind crap artificial ingredients. They're vegan, mint-a-rific, and have double the filling of normal Oreos. I try to stay away from them, but it's good to know they are Vegan! annnnd you have convinced me! I'm really good at being bad. I am really mad at you, because five minutes ago I didn't know that I was going to die without those cookies. And now i've seen them and I can't have them! You're going to be mad at me for a couple more weeks, or at least until I send you that picture.